Why Buy Less-Toxic Traffic Paint? Emissions from conventional solvent-based traffic paints used for striping roads and parking lots are hazardous to our health and the environment. These paints give off high levels of volatile organic compound (VOC) emissions, a known contributor to ozone and public health hazard. While sustainable traffic paint was once met with skepticism by pavement marking professionals, the technology has come a long way. Today, waterborne and bio-based striping paints are environmentally sustainable alternatives that rival the performance of petroleum-based products. The Washington State Department of Enterprise Services (DES) and Washington State Department of Ecology commissioned a report outlining Green Purchasing Best Practices concerning traffic paint. The report focuses on the ecological and human health threats of solvent or petroleum-based traffic marking paints used for striping highways, parking lots, pathways and airport runways. On hot summer days, particularly, the VOC components of paints mix with nitrogen oxide in the atmosphere to create ozone or smog. The emissions are detrimental to humans and the atmosphere. Because scientists have discovered that standard petroleum-based paints cause environmental and human health-related problems, the Environmental Protection Agency (EPA) has begun to establish guidelines to reduce the levels of VOCs in various products (including traffic paints). Waterborne and bio-based paints present far less risk to human health. Less toxic traffic paints with reduced VOC content do not emit the same environmentally hazardous smog into the atmosphere. High VOC solvent or petroleum-based paints can cause cancer. High lead, chromium and other heavy metal content in traditional striping paints can eventually mingle with the water supply to create a universal health hazard. Applicators who regularly handle solvent-based products face considerable health risks. Bio-based striping paints have equal or better durability than solvent-based paints. While many coating companies are working to reduce VOC levels of their products by changing formulations, they are still using the same petrochemicals as the base. BioStripe® approaches the low-VOC challenge from a raw perspective. BioStripe® is the first soy alkyd marking paint that is produced from a renewable and sustainable material, soybean oil. Moreover, BioStripe® has superior dirt resistance and color retention attributes as a result of its creative formulation. 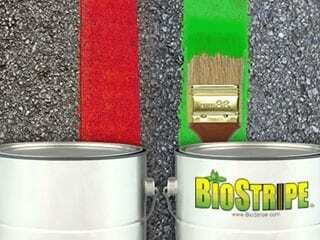 BioStripe® is the only USDA Certified bio-based traffic paint. The product is the only truly sustainable waterborne striping paint available. Moreover, the paint performs as well as petroleum-based paints and is economical. University, school system, hospital and public park officials that have embraced sustainable practices are usingBioStripe® paints for their parking lots and walkways. In fact, in 2016, the EPA awarded Medford Township in New Jersey its highest recognition for their environmental initiatives. One of these initiatives was the implementation ofBioStripe® paints for their parking lots. In 2016,BioStripe® was nominated for the Katerva Award for their innovative use of sustainable agricultural materials to produce high-performance traffic marking paint from soybeans. The Katerva Award recognizes companies that create revolutionary sustainable solutions that can bring notable impact within ten years. BioStripe® is supported by the Ohio Soybean Council, the Paint and Coatings Industry, and the Agricultural Utilization Research Institute. Do you use bio-based striping paint? If not, would your organization consider switching from your current paint to a more sustainable and eco-friendly option likeBioStripe®? Share your thoughts in the comments below!